The combination of ingredients in Asian snacks is pleasing to the palate. Above and beyond being loved for their delicious flavors, Asian snacks are also a nutritional treat. There’s an extensive list of health benefits associated with Asian snacks. Roasted green peas are considered a relatively low-calorie snack. There are 120 calories in a 30g serving. A large portion of those calories come from the carbohydrate content of these tasty little peas. In that 30g serving, there are 24g of carbohydrate. Carbohydrates provide energy and protect against disease. Another benefit found in roasted green peas is their high fiber content. You get 20% of the daily value of fiber in a 30g serving. Fiber is beneficial to your digestive system, colon health and contributes to a feeling of fullness. Wasabi peas can be eaten alone or added to an Asian snack mix to add some nutritional benefits to your diet. Like roasted green peas, Wasabi peas are a good source of fiber and carbohydrates. These peas are also a good source of iron and protein. The following benefits are associated with Wasabi. It can reduce the risk of cancer, act as an inflammatory, improve digestive and heart health and detoxify the liver. Roasted green peas and Wasabi peas can be eaten alone of included in a trail mix recipe. 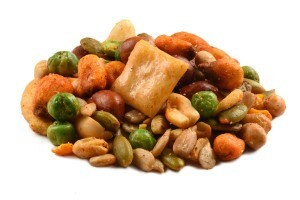 In addition to the peas, an Asian snack mix typically includes other healthy ingredients such as nuts, sunflower seeds, pumpkin seeds and soybeans. You’re likely to find sesame sticks, corn nuts and some unique spices in an Asian trail mix. Buying Asian snacks wholesale is a budget-friendly way to enjoy the flavor and health benefits these snacks provide. It is both time-saving and convenient to buy Asian snacks online. In addition to purchasing your favorite varieties of Asian snacks, you might want to try new varieties to expand the assortment you keep on hand. There are many things that can occur throughout the day or week that cause stress. Your snack selection should not be a source of stress for you. When you keep a supply of Asian rice crackers in your pantry, desk drawer, backpack or elsewhere, you will always have a simplistic, healthy and flavorful snack readily available. If you are the type of person who reaches for food when stressed, an Asian rice cracker mix is an ideal snack for you. You can eat each individual cracker separately to experience the precise flavor of that cracker or you can pop several in your mouth and experience a unique flavor that is sure to satisfy your snack urge. The slightly sweet glaze on Asian rice crackers is subtle yet it effectively enhances the flavor of the crackers. These crunchy little crackers, in various shapes and sizes, contain beneficial fiber protein, iron and carbohydrates. They are a fat-free snack. They are low in calories and can easily be included in a weight loss diet plan. Rice crackers are a tasty, healthy treat to include on a party table. They’re a fun snack for kids and teens. Overall, they are a healthier snack choice than potato chips or other fatty snacks. 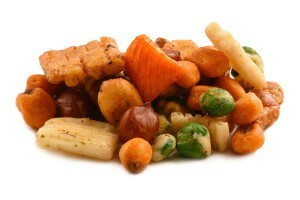 Asian trail mix is composed of a variety of healthy ingredients. It may contain healthy treats such as roasted green peas or Wasabi peas. It typically includes one or more types of nuts. Peanuts and honey roasted peanuts are frequently used in Asian trail mixes. The inclusion of peanuts increases the health benefits you obtain by eating the trail mix. Peanuts support heart health, boost memory, help fight against cancer, regulate blood sugar and help prevent age-related cognitive decline. Sunflower seeds and pumpkin seeds are included in some Asian trail mixes. Sunflower seeds provide support for your heart, bones, skin and nerves. Pumpkin seeds are credited with helping lower cholesterol, protect the prostate, improve bladder function and help reduce inflammation. Both seeds offer protection against cancer and depression. Some Asian snack mixes include soybeans. Soybeans help improve metabolism, decrease the risk of diabetes, support digestive health reduce the effects of menopause and help improve circulation. Just like many of the previously mentions healthy ingredient in Asian snack mixes soybeans help protect against cancer and provide support for your heart health. With the diverse selection of Asian trail mixes available, you can treat your palate to some sensational flavors while doing something good for your overall health. There are trail mixes available that have a spiciness that is sure to wake up your taste buds. There’s also mixes available for those who prefer mild, slightly sweet treats. Trail mix is a fantastic grab-and-go snack regardless of where you’re going. It’s great as a lunch box addition or a workday afternoon snack. It can accompany you on a road trip, hiking trip or a day at the beach. An Asian trail mix would be a healthier movie night snack than chips, candy or some other type of high calorie, fatty food.